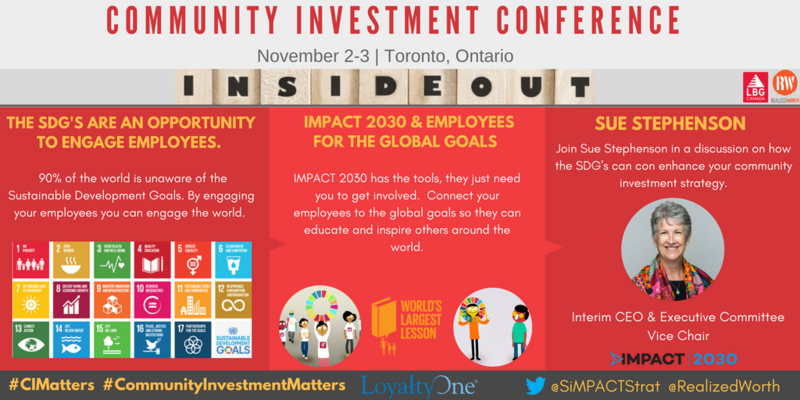 TORONTO, October 16, 2017 /3BL Media/ - Sue Stephenson, Interim CEO and Executive Committee Vice Chair of IMPACT 2030, will speak to "Why the SDG's are an Opportunity to Engage Employees" at the upcoming Toronto conference Inside Out: A Transformative Approach to Community Investment. Sue Stephenson’s discussion on "Why the SDG’s are an Opportunity to Engage Employees" will explore how you can engage your employees in the sustainable development goals and in turn enhance your own community investment strategy. Her discussion will focus on IMPACT 2030’s “Employees for the Global Goals” program; a project that connects employees to the SDG’s by providing them with the tools and knowledge to educate others on the SDG’s.